It's very important for a publisher To insert Sitemap (Table of Contents) in his blog to make it look more professional. Basically Sitemap (Table of contents) is a place in your blog where all of your post are arranged according to their type.This is the reason why today we will going to Insert a Table of Contents in Blogger. 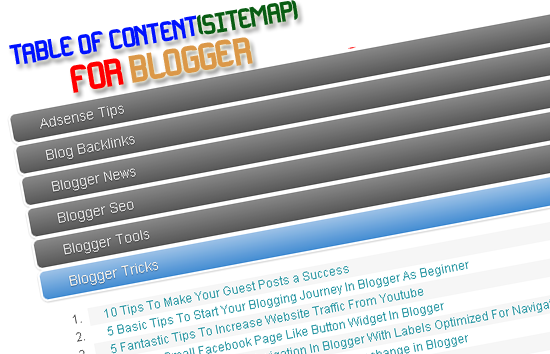 We have designed a table of contents for blogger which will update automatically so you don't need to just edit it every time when you publish a new post.If you publish a new post on your blog it will automatically added to your Table of Contents Page so it really saves lot of time.This Table of Contents widget will display all of your post well arranged under their specific categories (LABELS). This widget is designed and optimized with CSS so it looks really attractive and has some Jquery which do attract your eyes.So let us start our fingers rolling over the tutorial. Now after pasting the code above look for http://www.mybloggerlab.com and replace it with your blog URL and Publish the page now go and view your Amazing Table of Contents with Drop down style. http://geekyparigyan.blogspot.in/p/table-of-contents.html I have added i really like the "new" text!! Hey Bro, Don't worry The template you are using is not well formed this is the reason why the Page is not opening. Follow the Same Steps but Don't Create a Page instead of Creating a Page Publish a Post...I repeat Again Insert your Sitemap in a Post Not in a Page. And it will work Perfectly. Peace and Blessings. Is it possible to add "expand all" button in this site map page? Oh alright Brother it is complicated but not impossible, You can give admin access to me so I can help you further in this issue. Email Sent Brother, Yes why not i said previously MBL (MyBloggerLab) is yours we are here to assist you every time :). This article is about its advantages and disadvantages. hi bro, how can i put the table of content and the details in the same page? It is working on my blog @ http://discoverbooktravel.blogspot.com ! I am getting a TOC page, but it is blank. I do have a question. On the step that says to paste the code with the script, it doesn't say whether to paste it before, after, or replacing the existing code. Might that be my problem? Thanks a lot it worked absolutely well. At the start it worked properly but now it has messed up with my template. Now i cannot upload my previous template. Unfortunately, it is not possible with the current setting. Hi I've been loooking around on Google when i came across your site. The sitemap works fine and looks very profesional,thanks for sharing. Would it be possible to go into the .js scripts and change them? Yep, you can try your luck! I have alot of pages, and only one post. This only shows posts. How do I get pages too?